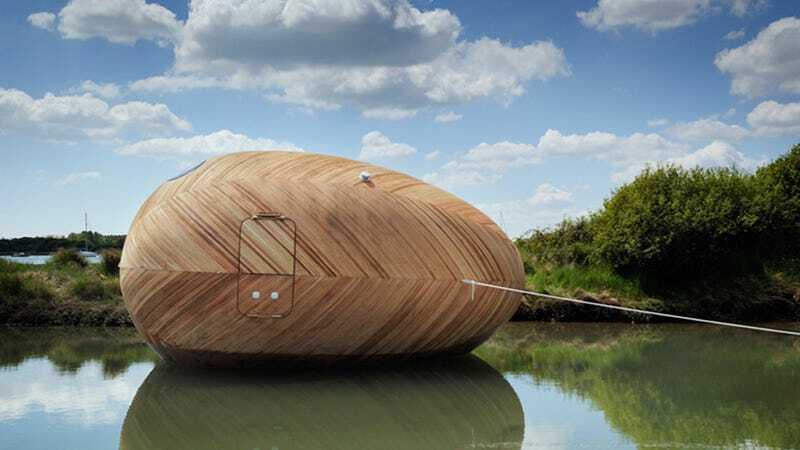 Uh, Why Is an Artist Living Inside a Floating Wooden Egg For a Year? There's a strong probability you'd go crazy living inside of an egg, despite the fact that you actually came from one. But artist Stephen Turner is up to the challenge. Starting this month, he'll be taking up residence in the Exbury Egg, a self-sustaining studio/home/boat/monument to fertility, for the next 365 days. Situated in the estuary of the Beaulieu River in Southern England, the egg was built in a collaboration between PAD Studio, the SPUD Group, and Turner himself. Inside, there's room for a bed, a desk, a wet room, and a little stove. No word on a bathroom, but he is living on a river, so draw your own conclusions. Climate change is already creating new shorelines and habitats. Established salt marsh is being eroded by a combination of rising sea levels and falling landmass and the entire littoral environment is in a state of flux. The implications for wildlife and for the flora as well as for people are challenging. Raising awareness of the past and the unfolding present of a very special location will be the task, whist living in an ethical relationship with nature and treading as lightly as possible upon the land.